Cox’s Bazar (Bangladesh) (AFP) – Many of the half a million Rohingya refugees newly arrived in Bangladesh are refusing to be registered because their ethnicity is not included in the document, slowing a process seen as key to their eventual return to Myanmar. The Bangladesh military began registering the estimated 480,000 new arrivals more than two weeks ago, but has so far only completed the process for around 24,000. On Thursday the coordinator for the registration centres said refugees were objecting to the language on the form, which refers to them simply as Myanmar nationals. “According to our information, they want to have the name ‘Rohingya’ in their cards beside their citizenship status,” Major Kabir Kibria told AFP. Registering the Rohingya is seen as key to their eventual return to Myanmar, whose de-facto civilian leader Aung San Suu Kyi has said the country would take back verified refugees. Aid agencies say it is also crucial to ensure that supplies are distributed evenly. The United Nations estimates around 480,000 Rohingya have crossed into Bangladesh since August 25 after fleeing violence in Myanmar’s Rakhine state. There were already at least 300,000 Rohingya living there after fleeing previous bouts of violence in Myanmar, which regards them as illegal immigrants even though they have lived there for many generations. Bangladesh recognises only a tiny proportion of the Rohingya as refugees, referring to the majority as undocumented Myanmar nationals. 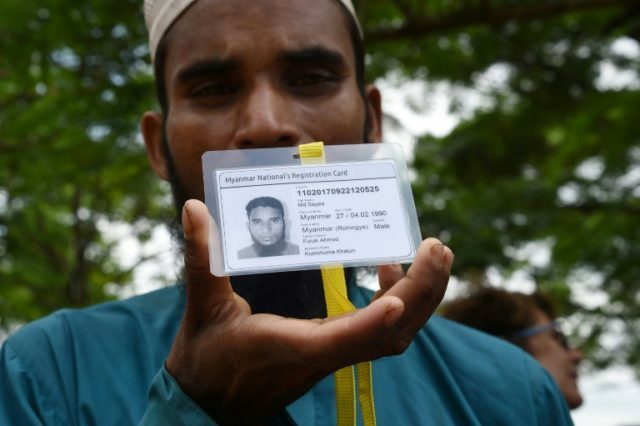 Nur Hakim, who received his registration card on Thursday said he was “not happy” that the card given to him at the registration centre did not carry the word “Rohingya”. “We are Rohingya Muslims. That’s our primary identity. Why is it not mentioned in our cards?” he said. One Bangladeshi official said the government’s decision not to include the refugees’ ethnicity was in line with international norms. “Many of their community leaders are spreading false information that the card wouldn’t work without ‘proper’ identification,” he said, speaking on condition of anonymity.